When most people think of supply chain risk, they often think about the impact of major unforeseen “headline grabbing” events - like the tsunami in Japan impacting automotive supply chains or horse meat making its way into British beef supplies. These are big, important and often unpredictable risks. But there is another kind of supply chain risk that isn’t as newsworthy and yet can also be important to the company. These are usually not global events, but disruptions that are internal to the company or at least specific to the company’s supply chain. For instance, a small supplier going bankrupt, a bad batch of product, or the loss of a key employee at an inopportune time. For the big risks, mature companies often perform scenario and contingency planning so that they know what to do when the major event happens, or they at least have a predetermined process for dealing with such unexpected or unplanned events. For these companies, the consequences of big magnitude risks make it worth detailed risk assessment, scenario creation and contingency planning. But a second type of risk that affects most companies’ supply chains is smaller and more mundane, but also more frequent. These events don’t fall into the ‘crisis’ category, but if dealt with in a purely reactive mode, can have a significant and unnecessary negative impact. These include both downside impacts, but also the risk of missed upside opportunity - often lost revenue when insufficient inventory renders a business unable to seize on, for example, an unexpected demand peak. Pharmaceutical manufacturer Cipla SA’s automated, flexible supply chain proved resilient enough to provide cover for its small planning team. As Joseph Ludorf, Executive Director Supply Chain, Cipla SA explained, “About a year back, both of my senior planners went on maternity leave at the same time. I was concerned that I wouldn’t be able to cope. However because of (our software) operating so autonomously …., we easily bridged that six-month period without any major problems. That was when I really knew we truly had a ‘worry-free’ supply chain.” Read more about Cipla here. Global prescription lens maker Shamir Optical needed to restructure its distribution network following a merger and re-privatization. A key test came when Shamir had to shut down its European distribution center in Portugal for two months to introduce a new warehouse management system (WMS). Shamir’s planning system allowed it to maintain seamless business continuity. The company managed to reroute all of its orders through other parts of the network and maintain service levels without their customers “noticing a thing”. A detailed account appears in Supply Chain Quarterly. Automotive parts supplier Lubinski imports Citroen and Peugeot spare parts into Israel. Because the company was profitable, it had no ‘burning platform’ to modernize. But at its local technology partner’s urging, it upgraded to a modern planning system to optimize its inventory of roughly 20,000 parts, of which 75 percent were slow-movers. Previously the company typically dealt with inventory shortfalls with rush orders by air. Now with a inventory planning system in place, rush shipping costs have been cut by one third, despite also reducing inventory costs by 25 percent and considerable waste and obsolescence savings, all the while maintaining above average service levels of 95-96 percent. Lubinski’s full story can be found here. 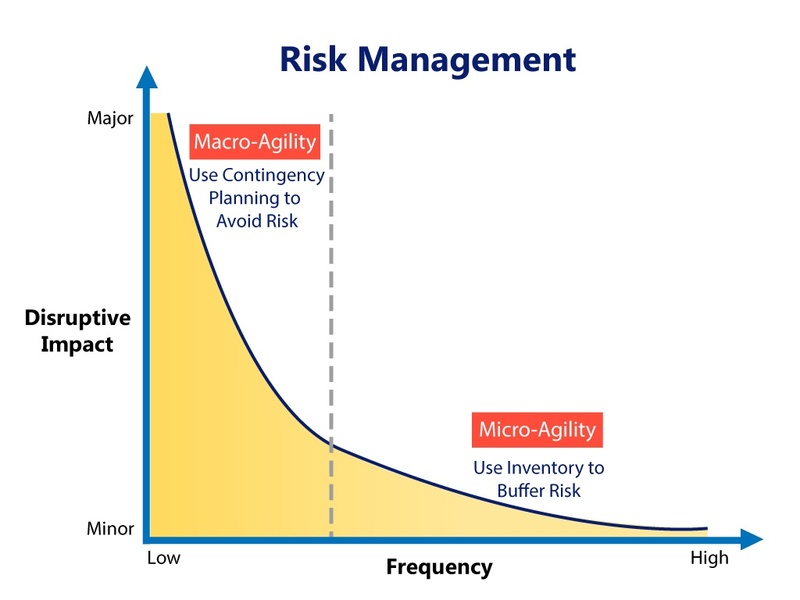 There’s another major upside for companies building in resilience, flexibility and visibility into their supply chains to manage ordinary business risks and maximize profits: they’re much better prepared when the occasional big headline-grabbing crisis comes along, even if they don’t know what it is and haven’t created a detailed plan for dealing with it.